Treat your family to the destination wedding trip you've always dreamed of, filled with fun in the sun and Unlimited-Luxury®. Dine in gourmet restaurants, unwind in a world-class spa and enjoy endless activities for every age and interest. With luxurious resorts throughout Mexico and the Dominican Republic, Dreams is the perfect seaside setting to create lifelong memories. Whether you head out on adventurous excursions with the group or your room becomes your very own private hideaway, their resorts make sure that you have an exceptional experience wherever you are. With Unlimited-Luxury® they go far beyond the all-inclusive experience, there's something for everyone to discover and enjoy and nearly everything is included, making your destination wedding or honeymoon even easier. No matter what amorous occasion beckons you to a Dreams Resort & Spa, you’ll be wrapped in luxury from the moment you arrive! Each Dreams resort offer special wedding and honeymoon touches to make it your own. 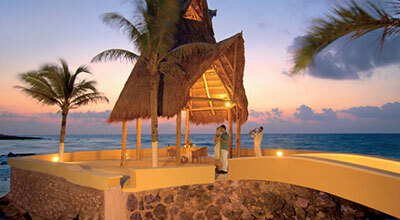 Dreams Resorts & Spas avoids the cookie-cutter wedding. Their on-site coordinators encourage you to send images from wedding blogs, magazines, even your Pinterest board, and they’ll help turn your vision into reality. As a bonus, you’ll be earning free nights toward your first anniversary return stay at any Dreams Resort & Spas! And of course if you’re there for your honeymoon you’ll enjoy plenty of special touches like breakfast in bed, a tension releasing massage and private beachfront dinner for two!